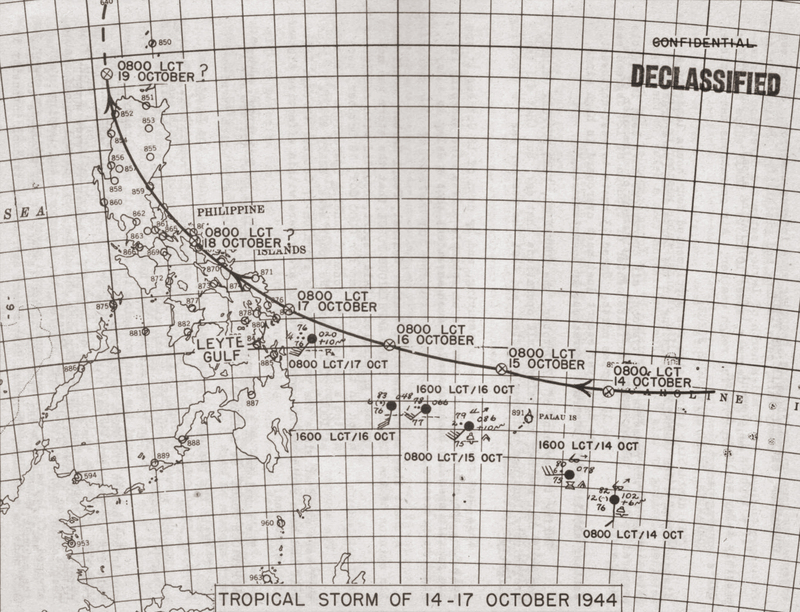 The September 19 diary entry of David Dashiell (via Navsource) recounts the typhoon in Buckner Bay. Last Saturday night we were alerted for a possible typhoon and early Sunday morning Typhoon Plan X-Ray was executed. Our orders were to remain in the harbor—larger vessels were to put to sea. We stayed at anchor all Sunday morning while the winds and seas built up. Shortly after noon our anchor chain snapped and we were underway with no hope of riding the storm at anchor. Our port anchor had bent flukes and the larger portion of our anchor chain was resting on the bottom of Buckner Bay. We proceeded to the harbor entrance, slowly gaining against the wind and sea. There was some confusion at the submarine net gate as a dozen ships manoeuvered for position there .in. heavy seas. After passing the net, the seas were larger yet and we began to wonder if we were wise in putting to sea Several LCI’s were steaming parallel to us in column. As they rode to the crest of a wave, sometimes half of their keels from the stem aft would be exposed before they nosed down and descended the back of the wave. Large cargo ships rode up and down on the waves even as the smaller craft. We proceeded into the storm for several hours in an easterly direction in order to put a little sea room between us and the island and then we came to a southwesterly course, taking the sea on our starboard quarter and running before it. The seas became greater and once we fell into the trough, sliding from the crest to the trough on our beam ends. At that time the ’55 seemed to hesitate with her starboard rail immersed before her stability asserted itself a’nd she returned to the perpendicular, (In retrospect, it seems to me that this occurred when we changed course, and it was the only time that I really feared for our survival). At this period of the storm, the barometer was falling rapidly. The sky was leaden gray and except for dark, indistinct scud, no individual clouds were discernible. The high winds whipped rain and spray along the surface of the dark grayish sea, streaking it with white marbling. On the bridge of the ’55, the men on watch wore oilskins and sou’westers. Rain water poured over them and salt spray whipped their faces. They braced themselves against the vessel’s roll and occasionally lost balance and sprawled on the slippery deck. The helmsman’s job was particularly difficult. His problem was to keep the vessel’s head up—to keep her out of the trough, intensified because he had to keep himself standing and at the same time fight the wheel. We continued to keep the storm on our starboard quarter, changing course to the left as the winds changed. In the northern hemisphere, such storms rotate counterclockwise around a nucleus which moves at a speed of advance of 9 to 15 knots. 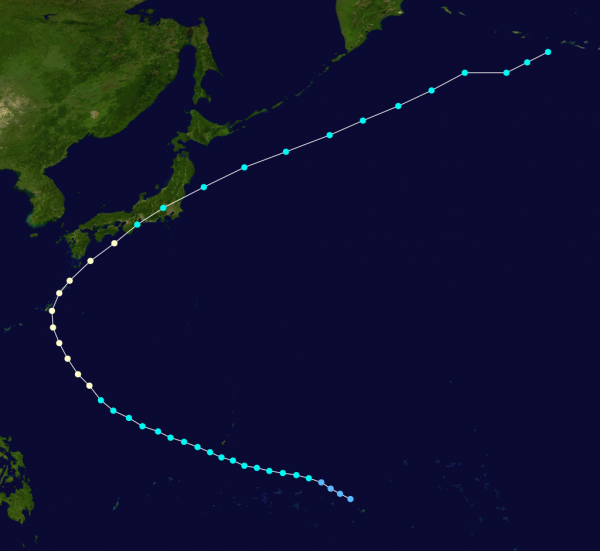 This storm, with a radius of two hundred miles, passed about one hundred miles to the eastward of Okinawa, so that the island received the brunt of the typhoon. Our object was to get south of the storm and ride away from it, and we succeeded. By the time that we reached point B, the storm center had reached point A and the barometer was on the rise again. The “Storm Course” line on the diagram shows the path of the storm center and around that, for a radius of two hundred miles, the typhoon raged, rotating in a counter-clockwise direction. When the typhoon had abated sufficiently, we headed back for Buckner Bay, 100 miles distant. We arrived Tuesday morning and learned that fifty ships had been lost. Ships of all descriptions are on the beaches. We hear that the loss of life from personnel who abandoned ship was very heavy. SC’s, LST’s, Liberty ships and other cargo ships are visible from here, high and dry. To add to the account as recorded in the diary, I remember that after we were clear of the island but still within voice range of the harbor radio circuit, the traffic was incredible. Ships were calling for assistance (one PC was asking permission of the Port Director to abandon ship). A YMS, whose CO was a friend of mine, left port at the same time we did. She failed to return and as far as I know, no wreckage was ever found. There was the tale of one PC which lost her mooring, was blown against a service force vessel, damaging the PC’s depth charge racks, allowing the depth charges to roll off under the other vessel. The charges were not set on “Safe” and blew a large hole in the other.vessel’s hull, taking her to the bottom. Some of the crew of one SC were reputed to have tried to abandon ship in a life raft and were drowned. I’m sure you remember the sacks of mail which we picked up on our return to Buckner Bay, which we found to be a mass of paper mache when opened. The post office had been blown away. 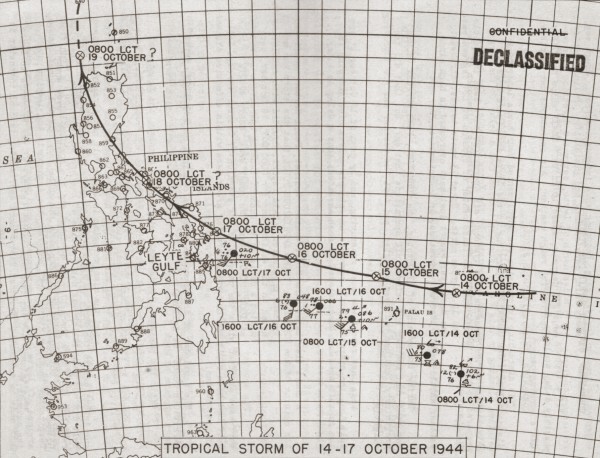 The tropical storm YMS-70 was foundered in also has significant documentation. The storm came as troops were preparing for an invasion of Leyte Island. October 17th included preparatory sweeping operations, in advance of the october 20th landing. Read the full report. This entry was posted on November 9, 2013, 9:47 pm and is filed under During Battle, Ships, Stories, YMS-103, YMS-341, YMS-421, YMS-472, YMS-70, YMS-98. You can follow any responses to this entry through RSS 2.0. You can leave a response, or trackback from your own site. These submarine chasers were 173 feet long. PC stood for Patrol, Coastal.